Jennifer and I met in 2000 when Hubby and I settled back in Santa Barbara with our children after moving around the world for nearly eighteen years. My kids and Jennifer’s kids went to the same school and like me, Jennier loves food and loves talking about food. We became fast friends. We would go on long morning walks discussing our latest new food finds, amongst a myriad of other topics, and then we would enjoy a hearty breakfast together. Jennifer owned my favorite children’s stores with locations throughout the state. The clothes were beautiful, the stores were cheery and inviting, and Jennifer was creative, positive and full of life, as she still is today. Jennifer moved on from children’s retail years ago and now she spreads her wisdom about retail operations at Merchant Therapy while still offering her Oprah-favorite Piggy Pajamas online to all her adoring PJ fans. She is just an all-round rock star in my group of interesting friends! And what a friend she is….when my brother died in 2011, Jennifer was the one who understood and knew what to do. Losing a sibling was strange. My brother didn’t live in my town so not many of my friend’s knew him and most had never met him. My family and my brother’s friends gathered around his wife and kids, as did I, and worried endlessly about how to make them feel better. We couldn’t imagine the grief they felt and how they would get through the next days, weeks and months. Everyone around us loved my brother and missed him terribly. We talked and cried and he was never out of our minds. But eventually, I had to leave my sister-in-law and come back to my home. Home where no one was talking about him, or crying over the loss, or grieving. The village that surrounded my sister-in-law was not available to me. It had been a couple of weeks since my brother’s death, I had been out of town since then, and most of my friends were busy with kids and school and jobs. They had expressed their sorrow for my loss and gone back to their lives. I didn’t blame them. I didn’t lose my husband or a child or someone my friends saw as an extension of me. My home life looked the same so it was easy to forget and move on. They couldn’t have known what I was going through and I was too overcome with grief to reach out to anyone. But Jennifer knew. She found out I was back in town and invited me to lunch. My sister who lives in Los Angeles was with me that day because she too was feeling alone with her loss and wanted to talk about it with someone who understood. The three of us had lunch, at Jennifer’s little kitchen table in her newly rented house on the hill. Jennifer gave me some gifts of her favorite new food finds from local stores. My sister and I nibbled on olives and blistered almonds while Jennifer made a divinely simple pasta with a sauce of imported truffle tomato paste, simmered in oil. She tossed beautiful fresh greens with olive oil and balsamic vinegar and aged parmesan cheese shaved in long slices. We sat and we ate and we talked. We talked about my brother, we talked about my sister-in-law, we talked about Jennifer’s sister who had passed away over 30 years prior, and we talked about the food. It was a lunch I will never forget. It fed my soul at one of the saddest times of my life. Jennifer is a master at simple, fresh, healthy food. She taught me the best roast chicken, the easiest great pasta, and showed me where to get the best almonds on earth. But my favorite Jennifer recipe is her granola. Jennifer and her childhood best friend Jenny tested and tasted for years to create their favorite combination of healthy, delicious, granola that they make regularly for their families. 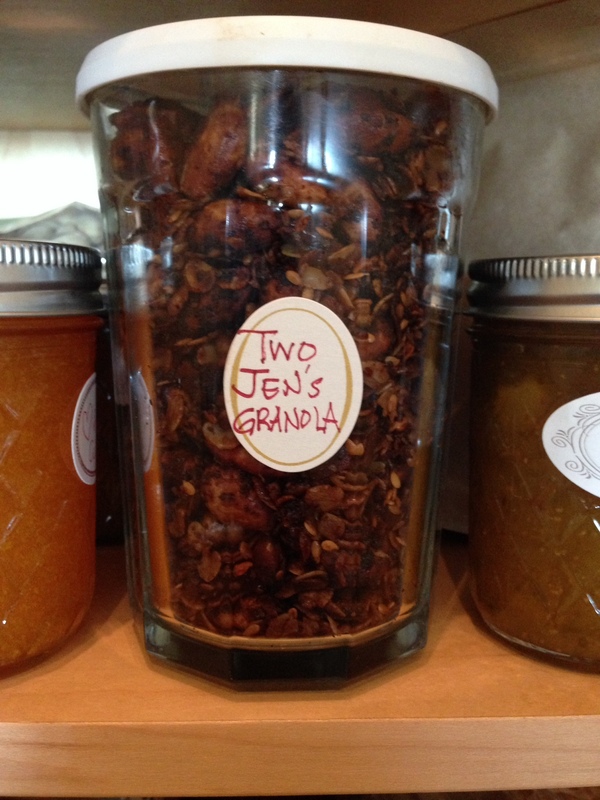 After Jennifer gave me a big jar of granola as a Christmas gift one year, I asked for the recipe and I have been making The Two Jen’s Granola ever since. I believe it is filled with love and wisdom and health. I suggest you share it with your friends and listen to their stories. Heat all liquid ingredients together and pour over all of the dry ingredients in a large roasting pan. Toast in 350 degree oven for 30-40 minutes, stirring/turning every 10 minutes to brown evenly. Remove from oven and cool completely, turning every 10 minutes until cool. Store in airtight container. Eat and enjoy! Love your stories, Cynthia, as well as your recipes. Thank you.